What is it? There's something about the city-building genre that seems to fire synapses in a way that provides us endless satisfaction. Whether it's the digital SimCity of yore or its cardboard counterparts like Suburbia and Dice City, we love fitting together these little steel and cement pieces to form graceful little engines of efficiency. 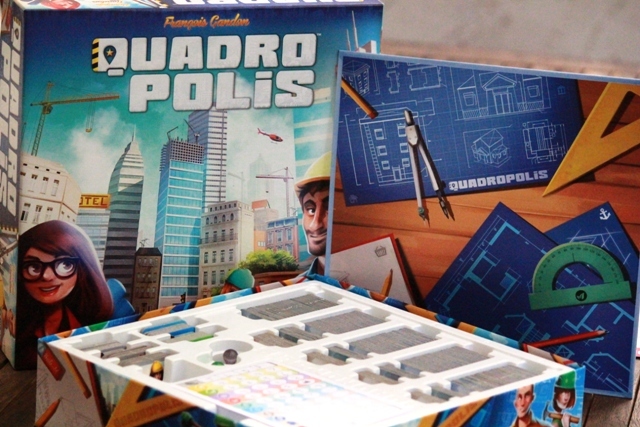 Quadropolis enters the fray with its innovative twist on the drafting mechanic, but will Days of Wonder's solid historical foundation give rise to a Burj Khalifa or a Trump Towers? If you’ve been following the hobby for a few years or more, you’ll know that Days of Wonder have developed a reputation for being the Blizzard of the boardgaming industry. Well, perhaps a touch more prolific than Blizzard, but their model is essentially to release only one new game a year which is then supported by a number of expansions. Ticket to Ride in 2004 which has had an expansion or stand alone released every year since, Memoir’44, BattleLore, Small World – they all follow the same pattern. Not only is it rare for one of their titles not to receive critical acclaim, but it’s such an effective approach that Asmodee snapped them up in 2014, clearly highly aware of their value. Such a sedate release schedule allows them to be rather choosy when it comes to publishing a new IP, as well as not being constrained to a particular style of game. Small World is not Relic Runners is not Shadows over Camelot, and each attempted to bring something a little different to the market. It hasn’t always been smooth sailing, with 2012 and 2013 bringing arguably less than stellar new releases, but Five Tribes stoked the steam engine once again and expectations for the next Days of Wonder release have increased accordingly. As varying as their catalogue is, one can certainly identify a formula of sorts – one part charming art style with a family appeal, one part deceptively simple, one part spit and polish of an older mechanic to make it new again. And that formula is more than evident in Quadropolis, as just a passing glance and the colourful art and back-of-box synopsis will tell you. All the elements are there, but has Days of Wonder managed to mix them in the right quantity? Scoring for parks, for each Tower block adjacent. I can imagine a thousand city planners crying out as one upon learning the rules, snapping their pencils in abject misery at the thought of the potential metropolises that will be built. Factories next to parks, harbours next to residences…what kind of madman is responsible for this? Well the answer is, you are. Not at first though, because each of you will begin with a pristine 4×4 city grid and the best of intentions. In the middle, a 5×5 Construction grid of building tiles and endless possibilities. At your disposal, four architects numbered 1 through 4, all eager to carry out your instructions to the letter, with a municipal efficiency you’ll never see in the real world. When it’s your turn, you’ll select one of the tiles on offer by placing an architect along either a row or a column of the grid, with the number of that architect corresponding to the desired tile’s order in that row or column. For example, architect 4 will be able to choose only the fourth tile of any row or column (but in any orthogonal direction, so left to right or right to left, top to bottom or bottom to top). That seems like a fair number of options, right? Well as any city planner will tell you, that’s just the start of your problems. See, that architect doesn’t just limit your choice of tile, but it also limits where you can place that tile on your city grid. Architect 4 can only build in row or column 4 (with certain exceptions). And because where there is construction there is bureaucracy, you’ll also have the Urbanist to deal with – no tiles in any row or column where the Urbanist is located are eligible for selection. Once you’ve chosen a tile, you move the Urbanist to that spot. Lots of talk about tiles, not a clue what they are or what you’re supposed to do with them. See? It’s just like you’re a real city planner! 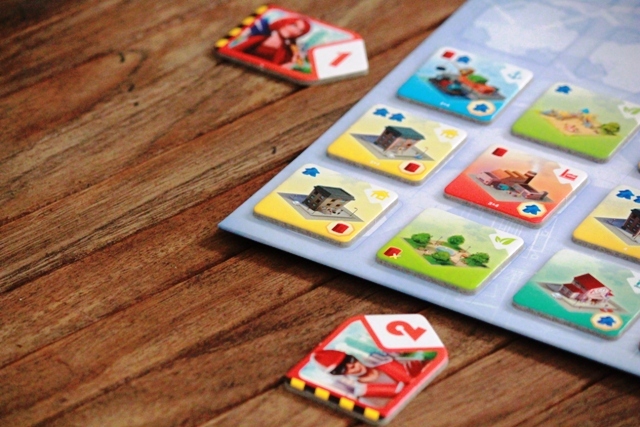 Quadropolis is played over 4 rounds, and each of those rounds has a matching set of Building tiles which in turn are randomly selected and placed on the 5×5 Construction grid. Any tiles not selected by the end of a round are removed, and the next round’s set are placed. Shops, Tower Blocks, Public Services, these are some of the buildings you’ll erect in your city. Certain buildings provide either Energy or Inhabitant resources which you take from the pool when choosing a tile. These resources are used to activate a building, which simply means that the tile will grant you victory points at the end of the game. How are points scored? Confusingly! At least, for your first game until you’ve memorised the handy scoring Helper. Essentially, you score points for certain tiles being adjacent, the height of Tower buildings, the number of Inhabitants on your Shop tiles etc. Unused Energy resources will cost you points, after all no one wants to live in a polluted city. At the end of four rounds, points are tallied and the ultimate municipal savant is revealed. Quadropolis doesn’t look all that complicated from the outside, what with its pretty tiles, clean grids and sparse iconography. And after you’ve gone through the excellently presented rulebook, you may catch yourself wondering is that it? A thought which is likely to last all of the first round, when your Park is in a corner and the only move you’re left with is to take a Factory tile and build it slap bang next to it. You would’ve taken the tower block to build a 2nd floor, but your opponent moved the Urbanist and now you’re left feeling like #1728 in the queue at city council with an armful of plans that’ll most likely be rejected. And that’s the nuclear power plant at the heart of the game. There’s almost an element of worker-placement in the approach to strategy, vying for the tiles that will allow you to effectively use resources and combine with the existing layout of your city to give you the most points possible. Even to the point of selecting your architects in such a way as to leave your opponent with poor options. I loved the unassuming manner in which that aspect of the game blossomed, slowly at first but then in such pleasing detail. And that’s just Quadropolis’ Classic mode! 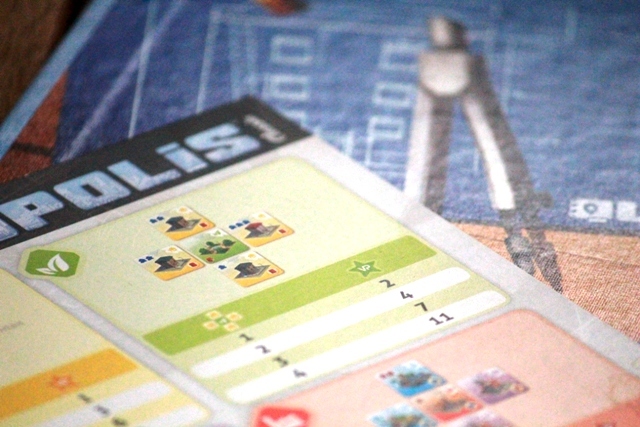 Flip all the boards and you’re presented with the even more devious Expert mode, which adds new building types, trickier city grids and a 5th round. 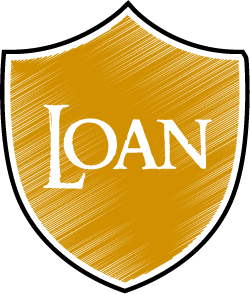 It also adds a little more play time, but by the time you graduate to Expert that’s only 90 minutes at the longest. The set-collection aspect, which is really what the tile-laying part of the game boils down to, didn’t click with quite the same finesse. It does what it’s meant to do, which is to add a points tallying mechanism to the rest of the game, but it felt a little too similar to certain selections from the Days of Wonder catalogue. I’ll admit, it’s a strange observation given it’s the accumulation of points that makes the Architect selection such a strategic process, but what I’m hinting at is that I do wish that first phase of Quadropolis was connected to a different means of achieving victory. Perhaps a shared grid where placing tiles was a more confrontational aspect, a sort of infinitely more complex version of tic tac toe. But that’s why I write reviews, not design games. Expert mode does address this to an extent, with Architects being played from a central pool as opposed to each player having their own set, but it remains an abstract drafting game nonetheless. What Quadropolis absolutely nails is accessibility. 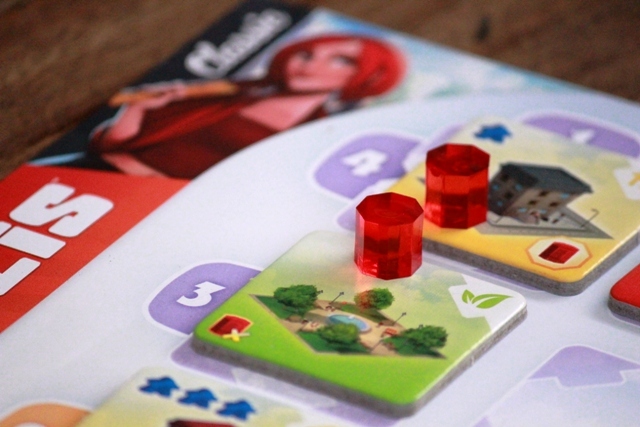 In Classic mode, it’s a good-looking game that’s easy enough to teach and quick enough to play that it will undoubtedly win new converts to the fold, and in Expert it adds enough bite that it won’t only leave the shelf when your novice gaming friends come to visit. What it also reveals though is that regardless of publishing frequency or historical success, boardgame design isn’t a chemical formula that yields the same result repeatedly. 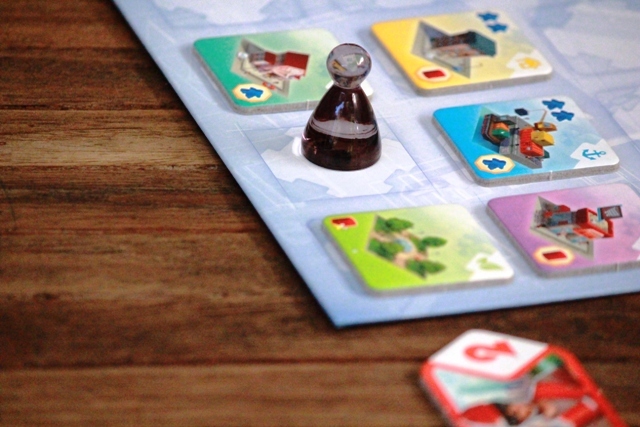 Quadropolis possesses all the elements of Days of Wonder’s more iconic titles, but ultimately falls somewhat short. Five Tribes proved that DoW could push into weightier territory and still achieve tremendous success, and though I appreciate that Quadropolis was designed for wider appeal and that DoW has always been focused on easy to learn family games, I can’t help but feel a little underwhelmed. 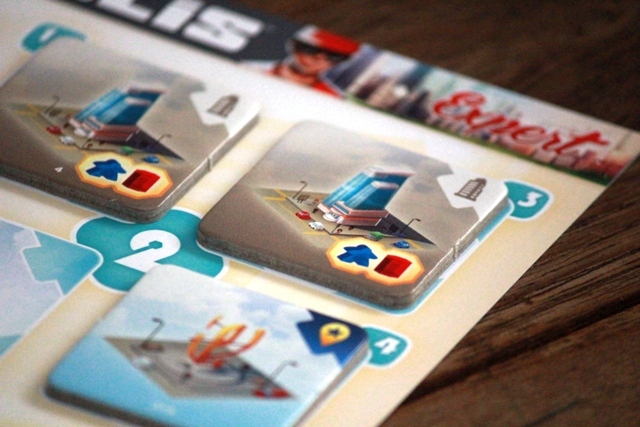 I'm torn on how to rate Quadropolis. It is a solid game - great components, interesting mechanics, engaging gameplay - and it should be viewed on its actual strengths and weaknesses, of which it has far more of the former than the latter. But Days of Wonder, like Blizzard, are a reminder that success goes hand in hand with expectation. Should you play Quadropolis? Yes, absolutely. But in terms of adding it to your collection? I think the deciding factor will be how strongly it appeals as a family game, because in that particular arena it's excellent. For me? I reckon I'll come back when the first expansion is available and perhaps then I might find a home for it.